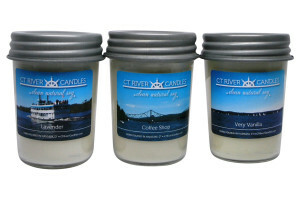 CT River Candles was inspired by the beauty of the Connecticut River. Established in 2007, their workshop, located in Haddam with a beautiful view of the river, gives the owner, Brenda Hunter lots of opportunity to take the photos featured on the candle labels. She hand pours all candles using 100% soy wax and fragrances formulated for soy wax and infused with essential oils.